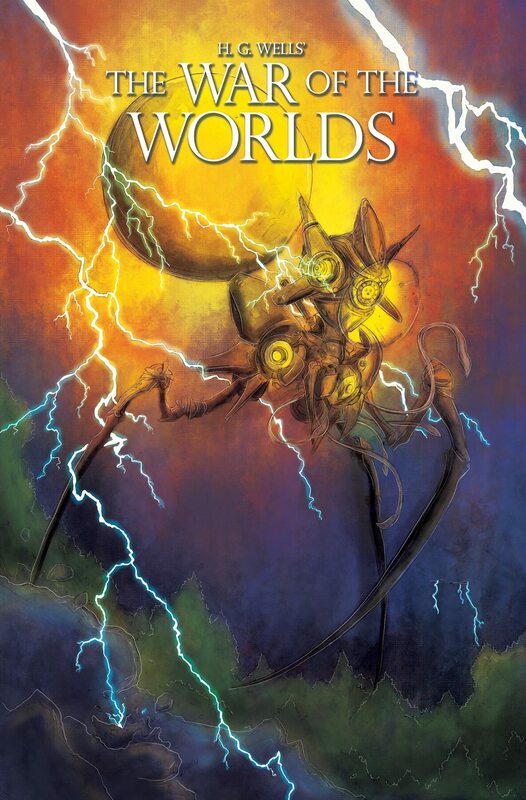 Lyndon White has already adapted Dracula, Inferno and Cthulhu into an impressive concertina book and now that he’s turned his attention to The War of the Worlds (a personal favourite of mine) then I just HAD to ask him some questions about it. What can we expect from your latest concertina book? In a word? War. I’ve adapted War of the Worlds and a key thing I wanted to focus on was the destruction and escalation of the Martian invasion, as they work their way across the landscape. You’ve got the key story beats of the Falling Star and Crater as they build towards the imagery of the Tripod like War Machines. It’s my take on those classic story moments in the concertina format. Have you had War of the Worlds in mind for this for a while? I knew that I wanted to continue this set of books that I’ve been building in the concertina format, but I wasn’t sure exactly what book I’d choose to adapt until early this year (2019). I’ve had a lot of suggestions thrown my way since Dracula launched on Kickstarter back in 2017 and was a run away success, which is awesome. It’s nice to know people want my take on some of these classic stories. H. G. Wells has a pool of incredible stories and has been on my radar for a while. I’m actually a big fan of The Time Machine (yes, including the film) and we very nearly ended up with a Time Machine concertina instead. What tipped the scales partly, was that the Musical was touring in the UK last year. Sadly, I missed out on going to see it but being reminded of all the visual imagery got me excited about drawing the story and doing my take on the Tripods. My brother and Dad actually got to see the musical in Manchester and from what they told me, it sounded incredible. I didn’t choose the story because it was currently more familiar in the public eye (at least in the UK), but it helped. These concertina books are a bit of niche format and while I’ll never choose a story for the sake of it, or because I think it will be popular, I do have to make sure it will appeal to a fan-base. People need to want the books otherwise there’s no point. Is tackling another classic story just as daunting as it was for the previous book? Very much so. A lot of these classics are so loved and well, classic. If you mess it up people will be pissed and they will tell you. Simply from a narrative perspective, they are great, there’s usually a reason why they’ve stuck around for so long. You don’t want some illustrator coming along and butchering it. It’s why I’m careful about which books I choose and why you don’t really see anything online or in reviews until the book is finished. Thankfully, people have been really supportive and seem happy with my story choices. I’m sure for some, War of the Worlds might not be their thing, but I might catch them on the next one. Or, from last year, someone might have not have been a Lovecraft fan, but loves sci-fi. There’s some common love for the format and my artwork across each book, but some people will pick and choose. The Kickstarter blew through it’s target pretty quickly – how does that feel? It’s incredible. You never really know for sure how a Kickstarter is going to go and the fact we were funded in under 5 hours is nuts! A lot of work goes into a Kickstarter, even before you launch it. Having people back the project early and even try to be the first backer is awesome. I had backers before I could even tweet it and do the social media rounds this year. I couldn’t really ask for more. What else can we expect from the Kickstarter campaign? We’ve gone past £2000 now, which was our first stretch goal and to give every backer a Kickstarter exclusive book-plate. It gives backers more bang for their book. The next target is set at £3500 to enclose each concertina in an envelope with a unique wax seal. This one is always a popular one with backers. It’s that final finish and production polish on the book. You don’t really get anything wax sealed anymore, so knowing I’ve hand stamped each book that arrives to backers is pretty special. If we manage to go even further than that, there’s #3 set at £4500 (which I know is a lot) and will mean I’ll illustrate the cover of The Time Machine and every backer will get a copy for free as a print. If you can’t tell by now, yes, I want to draw the Time Machine. The stretch goals are great to do, but they do need to be manageable. I’ve said this from day one, that these concertina’s are a smaller side project to the other things I’ve got going on. I utterly love making them, but there’s a limit to what I can do. Adapting Dante’s Inferno as a stretch goal with the Dracula Kickstarter was brilliant to do, but possibly a bit too much on my part. Thankfully at the time I managed to park my other projects and work on Inferno while Dracula was funding. I’m just not able to do that at the moment with War of the Worlds. Do you have a list of titles you’d like to turn into a concertina book? I’ve got suggestions that regularly come in. I tend to choose towards the end of the year and go from there. Dracula partly came about because I was meant to be doing a Dorian Grey graphic novel (again, one of my favourite books) which sadly fell through. Dorian could potentially be on there. Again, it’s something to think about in a few months time. Whatever I choose, I need to have my own take on it. What else are you working on just now? I’ve got two big projects on the go. One is an unannounced comic that I can’t really talk much about. It’s Lovecraft inspired but not a direct adaptation and I’m on art duties. There will be more info on that later this year. Otherwise, my main focus is my graphic novel Candles, which is funding via Unbound. Candles follows Grace on a quest to steal an evil Witch’s magic and use it to save her dying village. It’s very Brothers Grimm inspired and I’m doing everything from the writing, art, colours and lettering. Which is a lot of work. I recently finished the line work which is a huge milestone for the project. I’ve now got a visual for each page of the book and I’m working my way through inking. I’m really proud of everything I’m putting into this one and I’ll be putting together a bigger preview for people to read and hopefully, get them to jump on-board the crowdfunding campaign with Unbound. You can keep updated with Lyndon’s work over on his website and check out his Facebook, Twitter & Instagram pages for more updates. You can also check out his Unbound campaign he mentioned for his book, Candles. This entry was posted in Features, Interviews and tagged Kickstarter, Lyndon White, War of the Worlds by G-Man. Bookmark the permalink.